Do you have questions about solar energy? Our FAQs are designed to give you an overview of solar technology, solar installation, and solar economics, so you’ll have the confidence to go solar. Don’t see an answer you’re looking for here? 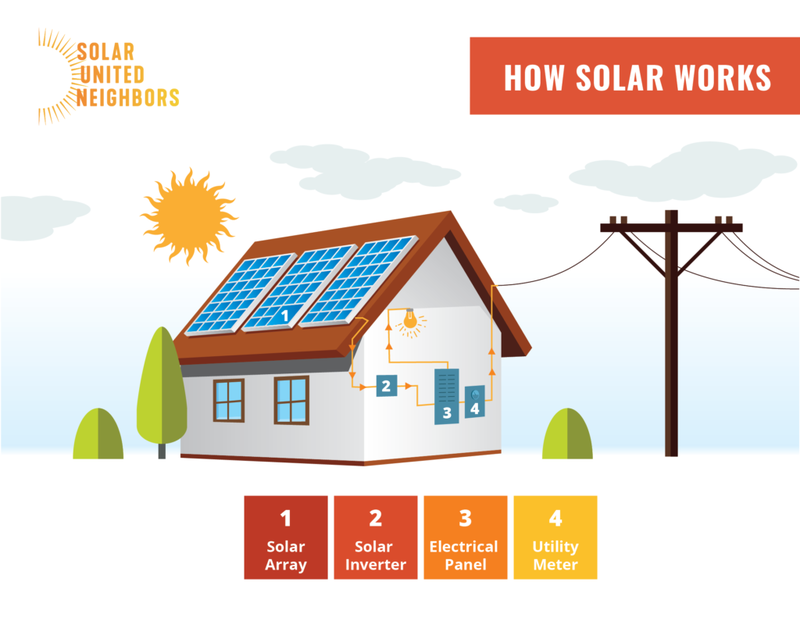 Contact info@solarunitedneighbors.org. Solar panels are made up of photovoltaic (PV) cells made of silicon. When the sun’s rays hit them, these cells convert sunlight to electricity. Individual cells are wired together to form a solar panel. Panels are typically three feet by five feet. They are coated in tempered glass, which allows them to withstand harsh weather. The electricity produced by a single solar panel is not enough to power a home or business, so multiple solar panels are needed. The number of panels varies by installation, but every solar system (also called an “array”) will include a series of panels mounted and wired together. This array may be installed on a roof (“rooftop solar”) or on the ground-level (“ground-mounted solar”). The electricity generated by solar panels takes the form of direct current (DC). However, most appliances and electricity-consuming objects (called “electric load”) require alternating current (AC). To convert the solar electricity from DC to AC, an inverter is needed. You will need to choose between two types of inverters: a central inverter and microinverters. While both perform the task of converting electricity from DC to AC, they differ in critical ways. A central inverter receives all of the electrical output of your entire solar system and converts it from DC to AC at a single, central location. A single central inverter is required for a solar system. It is often mounted on the side of your home or building next to your electric meter. Central inverters are steadfast and affordable, but they are susceptible to variations in panel performance. If one panel is shaded and produces less electricity than the others, the total electrical output will drop. If shading is of concern, microinverters can help maximize production. Unlike central inverters, microinverters individually mount to the backside of each individual solar panel. They capture the electricity that flows off of each panel, converting it immediately from DC to AC. With microinverters, if one panel is shaded, it will not affect the output of the whole array. By design, microinverters help maximize the conversion of electricity and are useful in situations with variable shading. What’s more, because they allow each panel to operate independently of one another, microinverters make it easy to add more panels to a solar array in the future. Once electricity is produced by the solar panels and converted from DC to AC by the inverter(s), it will flow through your electric meter and into your home or building. It will be used on site the moment it is created. Any excess will flow back out through your electric meter and onto the local grid. How long does a solar array last? Think of your solar array as a 25-year investment. Solar panels will produce electricity for at least 25 years. (See “Do systems come with warranties?” question for information on the warranties you’ll receive with your system) Panels will continue to generate electricity after 25 years, but at a decreasing rate. While microinverters will likely last for the duration of the PV system, you may need to replace central inverters after 15 years. The size of your optimal solar array will be influenced by many variables. Before analyzing those variables, you should understand how solar is sized and measured. The electrical capacity of solar panels is measured in watts (W). The typical solar panel is rated at 250-300 W. To get the total power (in watts) of your solar array, add together the wattages of each panel. Let’s say you had 10 300 W panels installed. The total wattage of your system would equal 3,000 W. 1,000 W is equal to 1 kilowatt (kW), so another way to describe the size of that system would be 3 kW. The average size of a solar array is 5 kW. Your installer will estimate how many panels can fit on your roof given its footprint and shade susceptibility to determine the ideal size of your system. If the size of your roof is limited (meaning fewer panels can be installed), installers can compensate by offering high-efficiency panels. These panels will have a higher power rating (typically 300-350 W), and therefore will produce more electricity per panel. 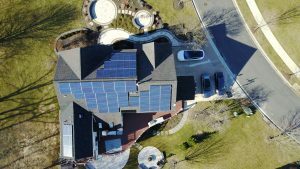 Installers will also use geospatial data to determine the optimal system size for your property, as roof orientation and climate factors will affect how much electricity your system produces. The final factor that will influence the size of your solar array is your project budget. Installers work closely with clients to maximize the amount of solar they install for the customer’s budget. While sizing your solar array, installers will consider how much the solar electrical output will offset your electricity needs. While the power capacity of solar panels is measured in watts (or kilowatts), the amount of electricity produced by the panels is measured in watt-hours (or kilowatt-hours). 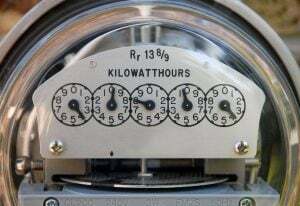 You may recognize the term kilowatt-hour (kWh) from your electric bill. Utilities charge their customers based on how many kWh of electricity they consume each month. If you look at your utility bill from any billing cycle, you’ll be able to see exactly how many kWh of electricity your home or building consumed that month. Each kW of solar you install will produce a certain number of kWh, which will directly offset your utility electricity consumption. The kW-to-kWh relationship varies with latitude and climate. Your installer will be able to accurately predict how many kWh of electricity your solar panels will produce each year. To estimate how much solar you can install on your roof (and how much electricity it will produce each year), we recommend using the PV Watts tool. To get a sense of how much your solar will offset your electricity needs, divide the annual kWh production estimate by your annual kWh consumption of utility electricity (the sum of 12 monthly bills). View tutorial. You will earn credit for the solar electricity you generate through a policy called net metering. Net metering allows you to offset your utility electricity consumption with the solar electricity your array produces. When your system generates electricity, that electricity flows into your home or building and is consumed on-site. When your solar panels produce more electricity than your home or building needs, the excess electricity is sent out to the local grid, where it is consumed by your neighbors. Through net metering, you receive full credit for the excess electricity you feed onto the grid. Once you install solar, your monthly electric bill will be calculated to reflect: the total amount of electricity you consumed minus the total amount of electricity you produced (i.e., the solar electricity you fed onto the grid). It is common for solar arrays to produce surplus electricity during certain times of the day, months, or seasons. Consider, for example, a sunny summer day. Your panels will produce a high volume of solar electricity during the day, but you are likely away from home and not consuming any of that electricity. In that case, the solar surplus will flow back out to the grid. Net metering enables you to receive credit for these seasonal or daily surpluses. Your utility will then apply those credits to your monthly bill, covering the electricity you purchase at night or during periods of low solar production. Should you have excess credit at the end of a billing cycle, you’ll be able to roll it over to the next month. By allowing you to offset your utility electricity consumption with your solar electricity production, net metering helps you reap the full financial value of your solar array. Most states have passed laws enabling net metering. If you live in a state with net metering legislation, you are guaranteed the right to net metering, regardless of where you live or who your utility company is. Learn more about state-specific net metering laws. Solar is a simple, minimum-maintenance technology. Unlike other energy technologies, solar PV contains no moving parts. This means it’s not likely your equipment will fail. You should not have to replace your panels at all during their lifetime. Wiring is the part of solar PV that most commonly requires maintenance because squirrels and other animals may tamper with it. Even in those cases, damage tends to be minimal. Solar panels do not need to be washed, as rain and snow naturally clean them. We do not recommend climbing up to your panels to wash them. Solar water heaters use the sun’s rays to generate thermal energy, or heat. The thermal energy heats up water, which flows into the home or building for later use. Solar United Neighbors supports the adoption of solar water heating, but does not include this technology in any of our co-op programming. We focus only on solar PV. Solar panels can be installed on almost any kind of roof material and almost any roof structure (flat roof, pitched roof, etc.). Panels are attached to your roof with a racking system. The best racking system for your home depends on how your roof is structured and what type of roofing materials you have. Your installer will recommend the racking system most appropriate for your property. Below are examples of the most common roof types on which people install solar and special racking considerations for each. Most homes in the United States feature roofs that are pitched (i.e.,angled) and covered with asphalt shingles. Roofers lay down these shingles in overlapping courses, or rows, that allow water to shed from them, waterproofing your roof. For asphalt shingle roofs, the most common racking arrangement will include flashings and rails. A flashing is a sheet of aluminum that slides up under several courses of shingles and attaches to the rafters of your roof. Aluminum rails are then connected to a standoff (small metal pole) that attaches to the flashing. Solar panels will be laid on top of these rails, securely connected with clamps. In some cases, your roof may not be suitable for solar. This can be due to obstructions on the roof (i.e., dormers, peaks, chimneys, HVAC vents, etc. ), the roof’s integrity, shading, orientation, or other structural factors. If your roof isn’t a good fit for solar, you may be able to install a ground-mounted system. For a ground-mounted system, you’ll need to have access to a clearing far away from trees and other objects that cast shadows. Most ground-mounted systems are composed of aluminum and stainless steel racking and are mounted on concrete footings in the ground. 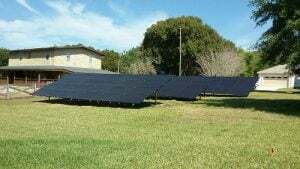 If you cannot produce your own solar electricity on your roof or with a ground-mount, you may be able to purchase solar electricity from a community solar array. Learn more about community solar and see if it’s available where you live. Most solar arrays don’t have batteries- yet. Most residential solar arrays in the United States remain grid-tied, meaning they’re connected to the utility electric grid. Grid-tied solar arrays are significantly less expensive than arrays with batteries. Standalone solar arrays are also more efficient than solar paired with storage. Batteries lose a small amount of their electrical charge as the current moves through them, making battery-paired solar arrays slightly less efficient that standalone solar. When paired with solar, batteries charge during the day and discharge their energy into the home (powering critical appliances) when the electric grid is out. 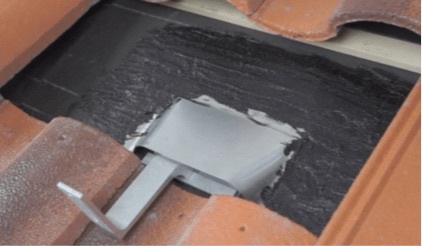 This allows you to utilize the electricity your solar panels generate even when the sun isn’t shining. The primary value of batteries today is for backup power. Pairing your solar array with batteries allows you to power your electrical needs even when the utility grid is down. Luckily, power reliability in the United States is high and grid outages happen relatively infrequently. Regardless, the opportunity to power necessary or desirable electrical loads during grid outages makes battery storage an attractive investment for many Americans. At present, batteries still come with a premium price tag (see our Battery Storage Guide for Homeowners for pricing information), however many home and business owners are taking the storage leap in order to access the backup power value batteries can provide them. As new rate designs and economic opportunities arise that increase the value proposition of battery storage (ex: time of use rates that incentivize customers to store electricity when it’s cheap and use it when utility prices are high), battery economics will change. Solar United Neighbors is tracking these developments and will share them with our network once they become available. Beyond the economics of battery storage, there are other technical considerations worth keeping in mind. Batteries take up room in your home, can require maintenance, and will likely need to be replaced at least once during the lifetime of your solar array. Additionally, and most importantly, there are different types of battery chemistries that affect how much energy you can store and draw upon during a grid outage. For more information on how batteries work, download our free Battery Storage for Homeowners guide. Orientation: Ideally, you should have a south-facing roof. In the northern hemisphere, south-facing roofs maximize the amount of sunlight your solar panels collect. The more sunlight they collect, the more electricity they produce, and the quicker you can pay off your system. You can still mount solar panels to your roof if it faces due east or west, but the panels will produce less energy (about 75% of what a south-facing roof would produce). 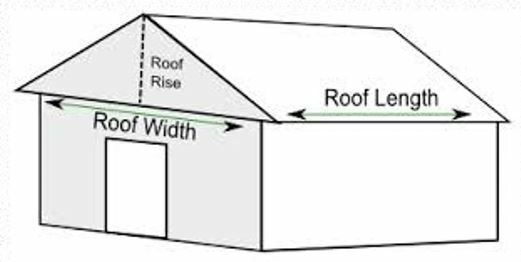 If you have a flat roof, the panels can be engineered to face due south no matter how your roof is oriented. Shading: Once you’ve determined that your roof is oriented in the right direction, the next step is to ensure that your roof is not shaded. The portions of the roof where solar will be installed should be free of shade for most of the day, as shade can significantly reduce electricity production. Trees, chimneys, dormers, and HVAC vents are factors that can cause shading on a roof. If you’re not sure if your roof is shaded, your installer can use a tool called the “solar pathfinder” to figure out if trees or other objects will cast shade during the day. Surface: Solar arrays are most efficient when they are installed in a large, uninterrupted space. Things like dormer windows, chimneys, vents, skylights, and air conditioning units can be obstacles to installing an array. Durability: Finally, if your roof is more than 15 years old, you may want to consider replacing it before installing solar panels. Most solar vendors recommend using roofing material that will last as long as the system (minimum of 25 years). A solar array will last at least 25 years. It’s important that the roof underneath it be in good shape. If your roof is more than 10 years old, we recommend having it evaluated to determine its remaining lifespan. You may want to consider repairs or replacement before installing solar. In many cases, work to improve the structural capacity of your roof to withstand a solar installation can be rolled into the 30 percent federal tax credit. (Note: This only applies to structural upgrades, not re-roofing). IRS code is vague on the exact scope of roof work that can be rolled into the federal tax credit. We suggest you consult with a tax expert on the specifics of your roof. 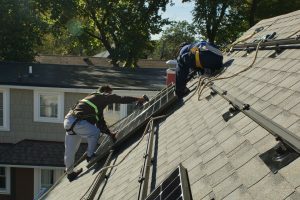 While we recommend completing all necessary roof work before installing solar, most installers are able to remove and re-install your panels at a later date (should you need to perform subsequent roof work). Costs for this vary, but typically range between $1,000 and $3,500. 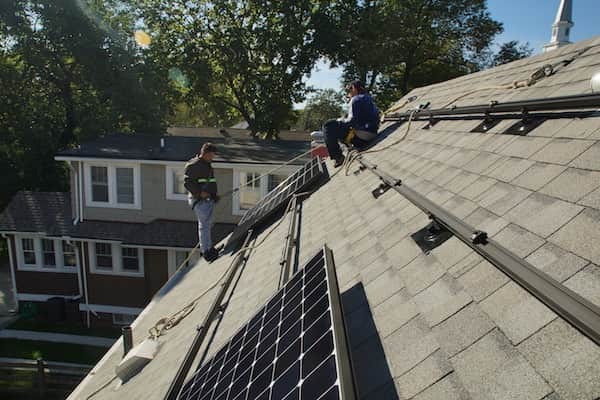 It typically takes one to two months for an installer to design your solar array and secure initial permits (from your municipal government) and interconnection agreements (from your electric utility). Depending on your exact solar permitting office and utility interconnection team, this could take anywhere from a few weeks to a few months. 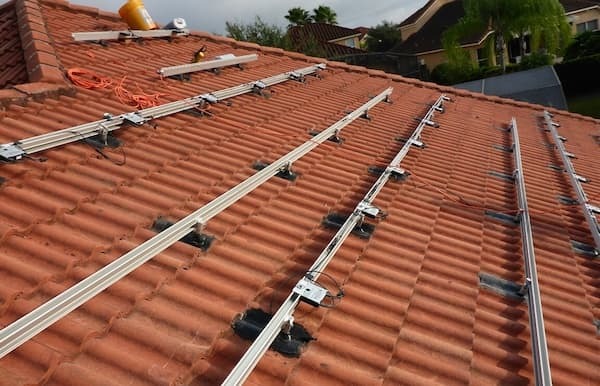 Once initial permits and interconnection agreements are in hand, your installer will typically need only one to two days to physically install your array (panels, inverter, racking system, and wiring). The installer will then need to get final approval from the municipal permitting office and secure final interconnection approval from the utility. This can take an additional one to three months depending on the jurisdiction. Solar installations come with three warranties: product warranties, power production warranties, and installation warranties. Product warranties guarantee the physical integrity of your solar panels and inverters. 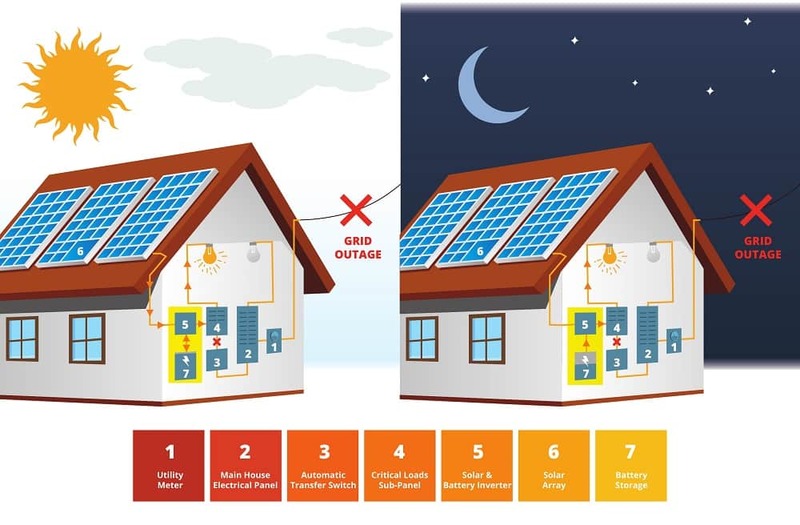 For example, should a soldered connection on one of your panels fail (adversely affecting its electricity production), that panel would be replaced under the product warranty. Product warranties are offered through the manufacturer, not your installer. For solar panels, most manufacturers offer a 10-year product warranty. Some high-end panel manufacturers offer longer product warranties, up to 25 years. Inverters come with product warranties that range from 10 to 25 years. Central (or string) inverter manufacturers offer 10- to 15-year product warranties, while microinverter manufacturers offer 25-year product warranties. Next, the power production warranty guarantees that the solar panel will produce at least 80 percent of its nameplate capacity for a minimum of 25 years. Just like the product warranty, the power production warranty is offered by the panel manufacturer. While details vary from manufacturer to manufacturer, the power production warranty assures that your system will continue to produce power over its lifetime. In practice, identifying whether your system is experiencing a drop in performance that violates this warranty is difficult without the assistance of an installer. Despite that, production warranties serve as a proxy for the expected performance degradation of your solar panels over time. Finally, the labor warranty covers the installer’s workmanship, including their electrical wiring work and any roof penetrations they make to attach your solar array to the roof. Unlike the product or power production warranties, the labor warranty is offered by your installer. Labor warranties vary among installers and regional markets. That said, they typically range from three to 10 years. Some installers will offer an option to upgrade to a longer labor warranty. If you believe your solar system is experiencing problems, contact your installer directly. The majority of systems will be installed with an online monitoring program that tracks the production of your array. You can use the data in your monitoring system to verify if your system is still producing energy at the same rate as before. Note: Keep in mind that energy production fluctuates from day to day, month to month, and year to year based on weather conditions and other natural factors. Despite these fluctuations, you should see a consistent curve of energy production over time. If you believe something is wrong with your system, contact your installer and send over any monitoring data you have. In some cases, installers will be able to view the production data themselves, and in others you’ll have to give them access to your monitoring system. Either way, they’ll be able to easily assess the problem and determine the best course of action. In extreme cases where the installer needs to dispatch a crew member to fix the problem, be sure to ask whether the costs are covered by their labor warranty. Many states have passed legislation preventing HOAs from denying their members the right to install solar. However, HOAs may still be allowed to place restrictions on how and where solar is installed on your property. Check out state-specific information on HOA solar laws. Regardless of HOA solar law, it’s a good idea to be upfront with your HOA about your solar installation plans. Let them know your installation date and share all relevant information (system size, number of panels, installation timeframe, etc.). 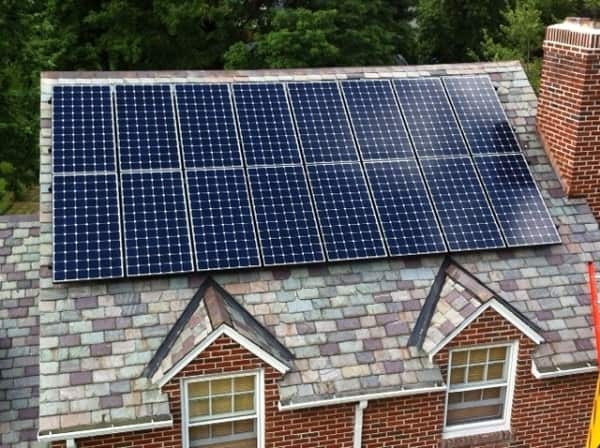 Most installers provide a mock-up image of what the array will look like on your roof (or ground) once installed, and this can be a compelling resource to share with your HOA. 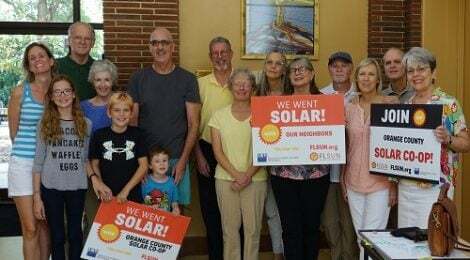 If you encounter resistance from your HOA, join your state Solar United Neighbors listserv and pose your challenge to the group. You’re likely not alone in facing HOA resistance, and others may be able to share their lessons learned. What’s more, let us know if you encounter HOA push-back. 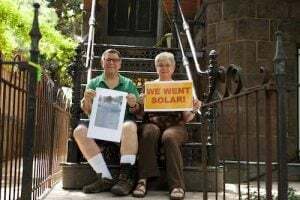 We can help you navigate the process and connect you with solar neighbors who have faced similar difficulties. We have also developed a guide to help homeowners change their HOA’s policies to be more solar-friendly. Solar installations in historic districts typically must go through an additional step in the permitting process to ensure the location and method of installation comply with local historic requirements. (e.g., solar panels cannot be visible from the street). In some jurisdictions, this review is part of the standard permit review process. In others, it is handled by a separate historic review board. Your installer will be familiar with the requirements in your area. You should expect your installer to work with the relevant review body to secure the necessary permits. The cost for historic district permitting should be included in your solar contract. Because solar permitting is handled by the local municipality, the permitting process will vary based on where you live. Most localities require installers to file for a solar permit, the stipulations of which differ by jurisdiction. Solar permits are in place to ensure that your system is installed safely and follows local code. From a customer perspective, you should not have to file any of the local permits yourself. Your installer should handle all permitting aspects themselves, including submitting the permit application and getting the solar system inspected. How should I read my electric bill? Even before you install solar, reading your electric bill can be confusing. There are several charges and different line items to keep straight. Check out this guide explaining the different components of your bill and how to identify them each month. Once you install solar, your monthly bill will look slightly different. Most notably, the bill will take into account “outbound energy,” or the solar electricity (kWh) you’ve exported to the grid in moments where it wasn’t needed at home. It’s important to be able to read your bill in order to verify that your utility company is accurately crediting you for your solar electricity. Click here for guidance about how to read your electric bill after going solar. How do I get compensated for the electricity I produce? Typically, you are compensated for your solar production by net metering. Net Metering allows solar energy generators to offset their energy consumption with their energy production. When your solar panels produce more electricity than you’re using on site, the excess electricity is sent out to the local grid. When this happens, your electric meter runs backwards, crediting you for this contribution. When you’re using more electricity than your system is generating, your electric meter runs forward, pulling the necessary extra electricity from the grid. At the end of the month, your final electric utility bill is your total usage minus the electricity that your solar panels produced. For more information, see our guide on net metering. While net metering is the primary policy that enables solar producers to be compensated, some states’ policies vary. To check the policy in your state, see DSIRE’s solar incentive database. What happens if I produce more electricity than I use? It is common for systems to produce more energy than a home consumes. This happens during the day when no one is home. However, it is uncommon for systems to be sized to produce more energy than you will consume over the course of a year. If you produce more energy than you consume on an annual basis, you will be compensated in different ways depending on the state policies in place. We do not recommend that you install a system that will produce more than 100 percent of your energy consumption, because you are often compensated for the excess electricity at a lower wholesale rate. What factors affect system pricing? Several factors dictate the price of your system, not just the cost of the panels themselves. Other factors include the price of the inverter, racking equipment, and engineering time as well as design, labor, and permitting. Many of these components are soft costs that are not based on the price of physical equipment. Solar United Neighbors aims to reduce these costs so home and business owners can see more savings when going solar. How much will my solar energy system cost? According to the Solar Energy Industries Association (SEIA) and Greentech Media Research (GTM), the average price for a residential solar installation is just below $3.00/W. 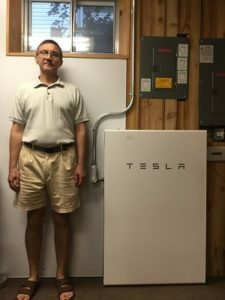 That means if you purchase a medium sized residential system of 5kW, it would cost about $15,000. This does not factor in the 30 percent federal tax credit or any additional incentives. 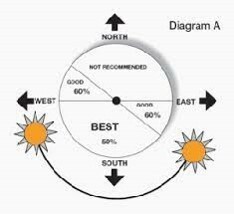 The price of a solar system can vary by your location as well as by which equipment and system size you opt for. Installers will be able to walk you through several options depending on your budget and individual preferences. If you opt to finance your system you may owe very little upfront and see savings right away. Owning a system outright means you purchase the system upfront, either with a loan or an upfront cash payment. Owning a system means you will retain the rights to all of the project’s additional incentives, like the 30 percent federal tax credit. Further, owning your system means you will be able to hedge your bets against rising electricity prices and lock in your solar production. Direct ownership of a system makes sense if you are able to pay for the system upfront or are able to take out a loan. If you’re planning to sell your home shortly after going solar, it may make sense to purchase the system. Owning the system outright makes it easy to transfer ownership of the panels to the new homeowners and to incorporate their price into the value of your home. Selling your home after going with a third-party ownership model is more complicated. To do so, you’ll need to pay off the remainder of the lease, effectively purchasing the system. If you don’t wish to pay off the system, the new home owners will have to agree to take over your current contract and pay off the remainder of the agreement themselves. 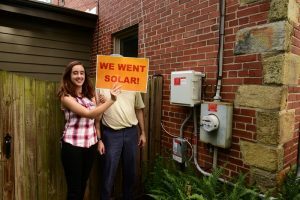 Financing a system you own: Modern financing mechanisms have made solar more affordable and available to anyone interested. When going solar there are several ways to finance a system that you own, including loans, Property Assessed Clean Energy programs, and other incentives. Secured loans require some sort of asset as collateral. The most attractive loan often is a home equity line of credit leveraging the value of your home with the installation of a clean energy system. The interest rates on home equity lines of credit are often very low and the interest paid on them is usually tax-deductible. You can get secured solar loans from a number of banks and credit unions across the nation. Another promising financing method is Property Assessed Clean Energy (PACE). 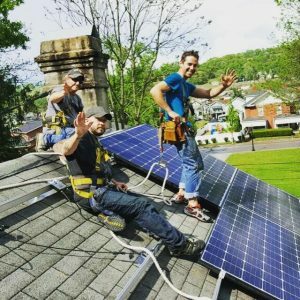 PACE programs connect building owners with long-term, no-money-down financing for energy upgrades, including solar installations. Under PACE, you repay the project financing over time through an additional charge on your annual property tax. The PACE program administrator will work with your municipality to calculate the additional annual property tax so that it is less than the annual savings from your energy upgrade, making PACE financing cashflow-positive from day one. Unfortunately, PACE is not available in all markets. PACE financing must be enabled through state legislation and enacted by your local government. For a list of active PACE programs, visit pacenation.us. 30 Percent Federal Tax Credit. The Energy Investment Tax Credit gives you 30 percent off the total cost of your solar system. This is calculated before other incentives. You still have to pay up front for the system, but when you file your taxes, you will receive a 30 percent credit (not a deduction) from the Federal Government. The tax credit is scheduled to drop from 30% to 26% in 2020, and to 22% in 2021. Learn more about the federal solar investment tax credit. Solar Renewable Energy Credits (SRECs). In some states, when you generate solar electricity from your system, you also generate an associated “green value” for your electricity. This is known as an SREC. Every time your system produces 1,000 kWh, or 1 MWh, of electricity, you get one SREC. These SRECs have a variable monetary value, like a company’s stock or commodity product, and, when sold on the open SREC market, can give you a revenue stream to help pay for your solar system. SREC prices are dictated by supply and demand of solar energy production and legislation called Renewable Portfolio Standards (RPS). Learn more about SRECs. USDA REAP (Rural Energy for America Program). REAP offers grants and loans to agricultural producers and small businesses in rural areas to install renewable energy systems. It also provides funding for energy efficiency improvements. Learn more about the REAP program. Additional Local Incentives. Several states and municipalities have developed additional incentives for those interested in installing solar: additional state tax or property tax credits, grants, rebates, and financing programs. For a more comprehensive look at the incentives available in your state, see our state guides. Third-party ownership means that a solar company will own and maintain the panels installed on your roof. 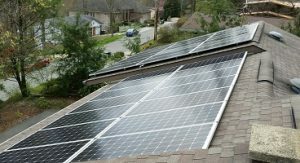 As the homeowner, you simply purchase the power the panels produce through a power purchase agreement (PPA) or pay a fixed, monthly rate (lease) for the panels. PPAs and leases can offer a no-upfront payment alternative when going solar, while still saving you money. Typically, the price of solar is lower than your standard electricity price, so you will see savings right away. A PPA or lease contract typically runs 15 years, but will often include an option for the homeowner to purchase the system outright later in the contract term. In this model, the company that owns the system will take advantage of the federal tax credit and any other available local incentives. Third-party ownership models allow individuals and organizations to go solar without a large initial capital outlay. The project developer is responsible for maintaining the system for the length of the contract. If you are unable to take advantage of the federal or state tax credits or other incentives, the installer will be able to and can pass on the savings. PPAs and leases can be complicated and organizations must dedicate time and money to ensuring that they negotiate a fair and equitable contract with the solar developer. Since the third-party, typically the installer, owns the system, the individual or business will not be able to take any incentives like SRECs or grants. At the end of the life of the contract (typically 15 years), you will usually have three options: purchase the system at fair market value, extend the life of your PPA or lease, or have the installer remove the panels from the roof. Most PPAs may increase the price you pay for the electricity your system produces over the life of your lease. This is known as an escalation rate, or escalator, for short. Sometimes those escalation rates are very steep, so make sure you look closely at the fine print of your contract. Third-party ownership is only available in certain states. Does the agreement include all components in the SEIA Transaction Disclosures? What is the cost of energy ($/kWh) in the agreement or the monthly payment? Is there an escalator for my monthly payments? In other words, will my monthly payment go up during the life of the agreement? If so, by how much and how often? If your payment goes up over time, the cost of electricity from your utility has to go up at a higher rate than your solar payment in order for you to save money with the solar system. What are my options if I decide to sell my house before the agreement ends? What are my options when the agreement ends? How long are roof penetrations warrantied? Why this is important because an installation warranty describes how long an installer’s work is covered against problems encountered due to the act of installing components on the home (e.g., roof leaks). You should determine if your agreement covers that for the entire term or for a shorter period. Will system components be covered for the life of the term or just for the manufacturer’s warranty length? What additional costs apply if equipment should fail after warranties expire? This is important because equipment warranties can range from 10 to 25 years. If you have a 20-year term on your agreement but the inverter (for example) is covered for 10 years, what happens in year 11 if it fails? Do you incur additional charges? Is additional insurance coverage provided by the company in the agreement? Will going solar affect my insurance? A report by the National Renewable Energy Laboratory (NREL) found that most rooftop solar systems should be covered as part of your standard homeowner’s insurance policy. Contact your insurance company before you install your system to let them know about the addition to your property. You should be sure to verify that solar system replacement costs, don’t exceed your current policy coverage limits in the event of damage. Adding solar should not increase your homeowner’s insurance premiums. If it does, you may want to find an insurer that provides discounts to customers who “go green”. The NREL report does note that ground-based solar systems may not be covered and may require additional insurance. 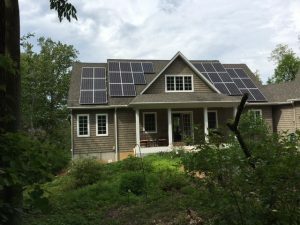 How will solar affect my home value if I want to sell? The answer depends upon your system’s ownership structure. The appraisal industry is training its workforce to accommodate the growth of solar nationwide. The Appraisal Institute now trains real estate appraisers on how to appropriately assess the value that solar and other energy efficiency measures add to a home. Make sure to request a real estate professional who is properly trained in evaluating the impact of solar when the time comes for your home to be appraised. If you own the system, it can convey with your home and help boost its resale value. A 2015 study by Lawrence Berkeley National Laboratory found that, on average, a typically sized residential solar system adds $15,000 to the resale value of a home. The study included an analysis of more than 22,000 home sales across eight states – nearly 4,000 of which contained PV systems. The home sale data spanned 2002 to 2013. If you lease the system, you may have a few options depending upon your lease agreement. It may be possible to transfer your lease as part of the home sale. Or you may have to pay off your lease before selling your home. You can then include the cost of this pay-off in your home’s sale price. If you are a licensed real estate appraiser and want to learn how to assess the value of solar in your appraisals, read more about the Appraisal Institute’s Valuation of Sustainable Buildings development program. 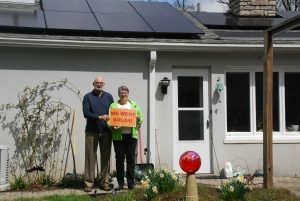 A solar co-op is a group of homeowners in a defined geographic area who use their combined purchasing power to ensure they receive the most competitive solar installation. Solar installers face significant costs finding, qualifying, and educating solar customers. 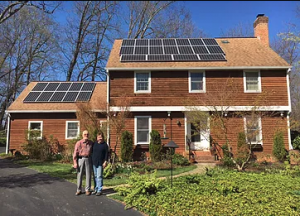 By forming a group of interested buyers, co-op members ensure the most competitive pricing because Solar United Neighbors has already done some of the work for the installer. More importantly, when you join one of our co-ops you get a free 1-year membership with Solar United Neighbors. Co-op Members have access to our installer-neutral and unbiased staff of solar experts to guide them through the installation process and understand topics like the value of their solar, local policies, and financing options. 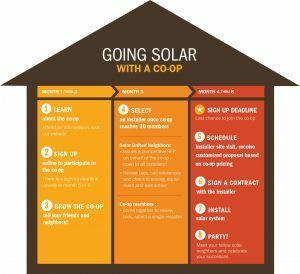 Solar United Neighbors provides educational resources, public information sessions, and one-on-one support for all Co-op Members. All of our members are able to join the growing movement of solar owners and are keyed into important issues and updates in solar. How does the co-op purchase work? Our unique co-op process helps ensure each Co-op Member gets a quality install from a vetted and neutrally-selected installer. What’s more, it cost nothing to join the group! We help each solar co-op develop a request for proposals from local installers, resulting in a competitive bidding process. We help the co-op form a selection committee to review each bid and select which one is best for the group. Solar United Neighbors is entirely installer neutral. The installer selection decision is solely up to group members. We provide support by ensuring each selection committee member understands all of the components of the bids and can make a fully informed decision. The winning installer’s bid will then set the price, equipment, warranties, and any additional components for all proposals issued to co-op members. 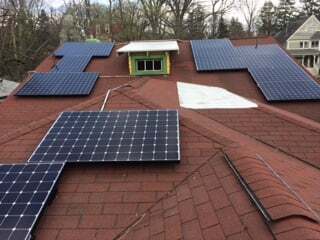 We work closely with Co-op Members once the installer is chosen to evaluate their solar contracts and advocate on their behalf during the installation process. We are able to provide one-on-one support to any Member who needs additional help. We ensure that our Co-op Members have everything they need before going solar. Once the installer has finished work on all of the co-op homes that have gone solar, we throw a big party to celebrate the success of the co-op and recognize everyone that helped along the way. The support of our installers, partners, Co-op Members, and local leaders makes our co-ops possible.